The photo showed up on my Facebook feed this morning and I realized that this election and aftermath is mirroring much more than any Dem/Rep ideological conflict. The election itself has re-traumatized many of us. It is NOT about the PEOPLE. It is about what it says about WE THE PEOPLE. To normalize hate and ridicule, to pit us against each other, to divide us rather than calling for UNITED action, to empower violence in thought, word and deed against any number of ‘others’ is WRONG. Bullying, intimidation and abuse of any sort is WRONG. Express your opinion. Calling names is NOT an opinion. Express your feelings. YOUR feelings. Anger at someone mirrors what we do not like about ourselves. Anger about something shows us where we need to heal. The day after the election, I spent about half the day sobbing. My husband did not understand my reaction. He said I take things too personally. He at least understood that while he did not get it, he asked our older son to call me, told him that “Mom is distressed.” We had a good talk. He got it. I have had many good talks with many people who get it. We who reacted viscerally, have wounds. Wounds that still need healing. God knows I have spent 50 years dealing with being child-fucked. Eight years of grooming and abuse that escalated to violence that not only emotionally and psychologically affect me and my ability to have relationships, it PHYSICALLY affected me, my lady parts, my times of the month and my fertility. Yes, I am grateful to have two fabulous Russian born sons, so, I am the first to acknowledge that good comes from bad. 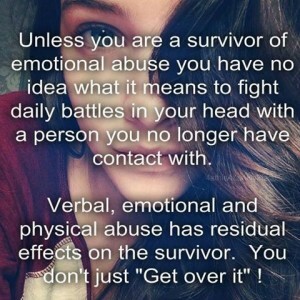 The abuse we experienced, the traumas are not something you ‘get over.’ A bad haircut grows out. Having acid thrown in your face cannot be washed away. The soldier missing a limb is understood more than the soldier who saw his buddy being blown to bits. Many of us have the continual loops, the inner voices criticizing, name calling, ridiculing us, making us afraid to speak our truth. One of the worst effects of my PTSD was nightmares and night-terrors. No need to describe them. The abuser was IN MY HEAD and I would wake up screaming, terrified. On average, this happened twice a week for about 50 years. Many nights, I was afraid to go to sleep. In the past year, I have done very active and intentional work and the nightmares stopped. Guess who started showing up in my dreams after the election? Yep, more work to do. I am not saying that Donald Trump is responsible for my nightmares. I am saying that feeling that I live in a country that validates sexual abuse, hate and misogyny activated my wounds. I do not think that every single person who voted for Donald Trump supports hate. I understand that jobs are gone. Technology eliminates some industry. Progress provides new opportunities. I understand that a large segment of our population pays through the nose for health care. Let’s call out the REAL reason for job loss and unaffordable health care. Corporate Greed. As long as we allow health decisions to be made by entities whose only goal is a larger profit margin, people will be denied health care or pay many times what a procedure really costs. As long as we allow corporations to NOT pay taxes, not be accountable for closing factories and do anything because MORE PROFIT MUST BE MADE, this will continue. It used to be okay for the boss to make 2-4 times what the worker made. He was the boss, he took the responsibility for the business. When did bosses start needing to make 50 times what a worker makes? What made making money by destroying others become okay? Wall Street, the housing crisis, pensions lost, lives ruined. None of this is okay. I am not getting over it. I AM DEALING WITH IT. I am dealing with all of it the best way I know how. I support charities. I buy the work of struggling artists. I have always volunteered. I do what I can to support anyone being harassed. After 9/11, I wore a head covering because random acts of hate were happening to women and I wanted to stand in solidarity. If there are EVER registries for ANYONE I will register. I may end up being on record as a Muslim, Jewish, Hindu LGBTQIA, Mexican. No worries. I have lived my life as a daughter, wife, mother, friend, child sexual abuse survivor. I will continue to survive, create and thrive. I will strive to respect myself, respect others and take total responsibility for my thoughts, words and actions with both humor and grace. This entry was posted in Uncategorized on November 21, 2016 by MamaPorter. Thank you for this Karen. Beautiful, heart felt and so very real. Karen, this is an excellent blog post about why victims of abuse were triggered by this election. Thank you for sharing the depth and the layers. You have given me a much deeper understanding of childhood sexual abuse. I am so sorry for what you have gone thru but I am also so impressed w/ your willingness to share w/ everyone how your your deep & continuing work to deal with it. It’s an extraordinary story. Thank you so much for sharing. I’m sickened at this election and its traumatizing effects on so many.